Dan Berlingeri, Monique Huff and Mirirai Sithole in Snow White Zombie. Photo by Isaiah Tanenbaum. BOTTOM LINE: The EstroGenius Festival succeeds once again in presenting entertaining and thought-provoking short plays that are mostly written and directed by women. Looking for an entertaining, diverse lineup of theatre that won’t break the bank? Then head on down to the 4th Street Theatre for Manhattan Theatre Source’s EstroGenius Festival. Back for its whopping 15th season, this array of vignettes (mostly) written and directed by women and starring mostly female actors once again hits many high notes. Since its inception in the year 2000 by founder Fiona Jones, EstroGenius has been putting together a variety of dance, visual art, teen performances, short plays and solo shows conceived and produced by women as a celebration of women artists. This year’s offerings, broken apart into three different groupings and produced by three different producers, are not only as audacious and as creative as they’ve ever been, but also funny, warm, and clever. Andi’s Night, named after producer Andi Cohen, starts off with a rip-roaring hybrid of Snow White and zombies in Brent Lengel’s Snow White Zombie. And no, although some of these characters are "More Human Than Human," there is no homage to the band White Zombie. This dark comedy is whimsical, hysterical, and boasts some pretty good performances given the two opposite genres. Reminiscent of playwright and fight director Qui Nguyen’s work, Nicholas Shuhan’s choreography delights in every possible way. 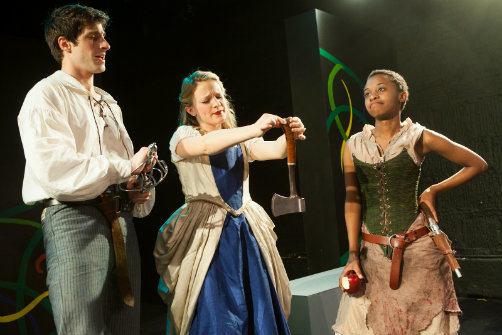 Although everything works well for the enjoyment of this play, its success can be mostly attributed to the writer’s decision to take non-traditional routes: no slow-walking walkers and very little gore, and Monique Huff’s ironic and sardonically funny performance as Snow White. Right on the heels of the zombie apocalypse is Bekah Brunstetter’s I Have It, a piece about the first date of two people who both have herpes. Although this play lacks dimension, the rapport between the two characters is quite engaging and the subject matter, veiled but not obscured, is provocative. As Lady, the lonely and partially unhinged firecracker, Maureen Von Trease sparkles onstage. Moving back into darker territory is Connie Schindewolf’s A Bottle of Vodka. This message-laden play traps two alcoholics together in a place suspended between space and time where indulging in alcohol and other addictions is forbidden. Favoring concept over plot or characters, A Bottle of Vodka, above all the other plays that are part of Andi’s Night, has the potential to be developed into a longer, more substantial play. Evoking the most emotions is Lisa Bruna’s Invasion. When two neighbors who never acknowledge each other are suddenly trapped in an elevator together, they each learn that the other knows far more about them that at least one of them would prefer. Thanks to Trey Blackburn’s brilliant performance as Blue, the audience is led through many different feelings that range from amusement to being creeped out. He creates motion in what is occasionally tiresome dialogue between himself and Candace, the snooty, executive neighbor played by Renee Stork. The show concludes with Catherine Noah’s Glutton for Punishment, a game of wits in purgatory between a yogi (Jenny Green) and Satan (played sans horns or red and black by Lizzy Lincoln). Of the five plays in this grouping, Glutton for Punishment is the smartest, with the adjudicator and the judged acting as an intriguing cat and mouse. So, what do you get if you buy tickets to the EstroGenius Festival? For a mere $18, you get zombies, fairytales, herpes, alcoholics, stalkers, and purgatory. And did I mention excitement and fun? What more do you want?